Recycling for Newaygo County celebrates our 12th Anniversary in 2016. What an exciting dozen years we have enjoyed, continuously increasing the amount of recyclables we collect at seven collection sites in and skirting Newaygo County. The community-based organization was formed in May, 2004 after a steering committee of concerned citizens, as their February FACF application was approved. Bob Pinder was hired as the Executive Director in July. In September the steering committee officially named itself the first Board of Directors, to be called Recycling for Newaygo County. Newaygo County’s MSU Extension Office oversaw the program until RNC filed our own articles incorporating in 2008 as a 501(c)(3) nonprofit organization. 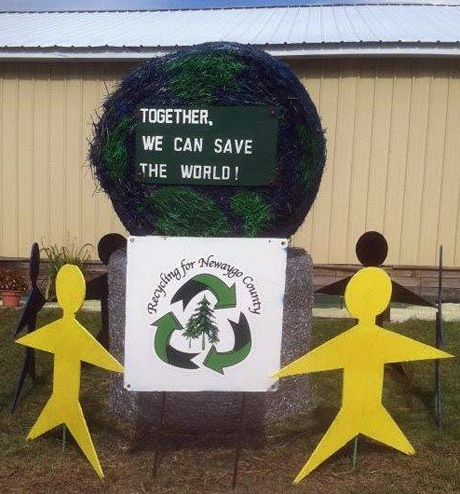 Currently, Recycling for Newaygo County is served by a Board of Directors, and operates with an executive director and a plant manager, and occasionally volunteer help. See our Profile Page for more details. At September 30, 2016, with 11 years of collections under our belt, RNC will have diverted 38.4 Million tons of recyclable materials from landfills, and to re-use.